I'm baaaack! With a very short vignette that was almost three years in the making. 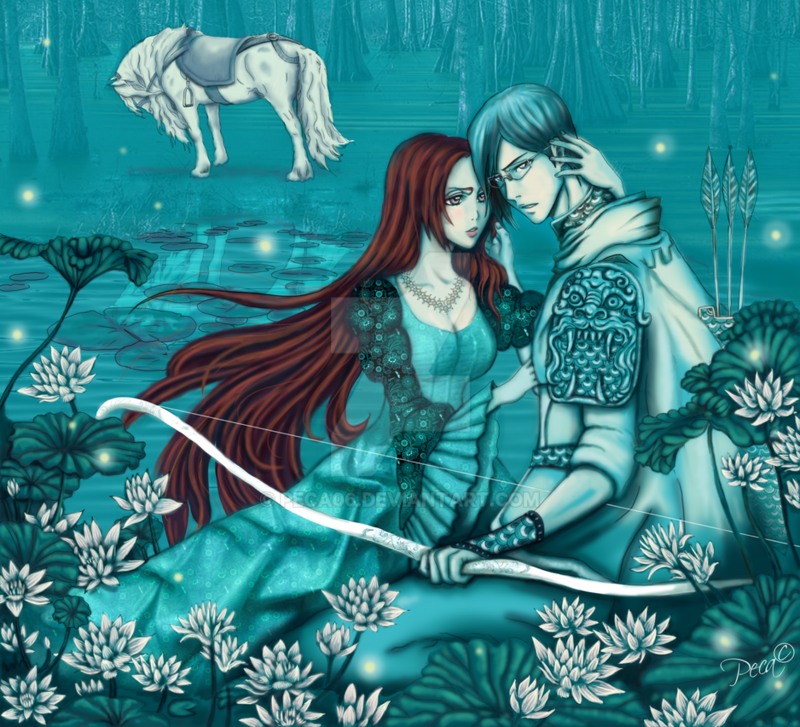 For my dear friend Peggy who won an IshiHime contest a while back with the art below (http://pre05.deviantart.net/5cd3/th/pre/i/2015/109/8/8/ishihime_fairy_tale_by_peca06-d6ueyue.png), I present "The Frog Princess" a tiny piece I tried to work into the current storyline (somehow?) I still love Orihime, despite what people say, and I want the best for her, with or without Ishida-kun. Once upon a time in Tokyo there lived a young girl who would whistle for hours as she walked sidewalks to nowhere. On school days, vacation days, days when red dragonflies skimmed new ponds of rainwater in the streets, she stepped in time with her wistful song and daydreamed about a boy she liked. She told herself that she was lost, but her feet always returned to a run-down building before dusk. Inside the tiny apartment, she would smear her dinner with sweet jam, brush her teeth, unroll her futon and enter her night dreams. Night dreams were confusing. Unlike dreams conjured in the light, they could not be controlled. The boy who offered a pink rose in her waking thoughts was a living skeleton at night. A bony hand would emerge from a black sleeve, offering a sake cup—uh-oh! Was the rich liquid blood? “Inoue,” a gruff voice would call. She woke up. Looking around, she wondered if she was still dreaming. Wasn’t she home now? Wasn’t she home? Where did she want to be? With the boy she liked—she was sure of that. Where was the boy? She stopped and found herself where the sidewalk sloped into the street, the concrete changing color, darkening as it blended into the traffic lane. There was no traffic. There was no boy. She was alone, and the reason the air was so still was because she had stopped whistling her tune. She was utterly alone, and it was so quiet. She could hear far-off noises of children shouting. No birds or the hum of cars, just a sound-less breeze and that playground somewhere—did she want to be there? “I want to be with Kurosaki-kun,” she said aloud to herself. But the daydream didn’t come this time. The boy did not appear and offer her a rose; he did not take her hand and walk her across the street. She moved across the street alone, and although her lips formed a little o, no whistling happened. After she reached her apartment, she asked herself if she could call this place where she slept “home.” She wondered if daydreams came from her own imagination but dreams at night came from some other source—angels, gods, her future self? She had no answers, and in this state of confusion, a little sad and forgetting to eat dinner, she fell asleep…. Kurosaki-kun was pointing at her. “The king said you have to marry whoever is standing where your arrow falls.” Kurosaki-kun was talking about marriage? This must be a very strange dream. There stood the boy she liked, wearing tight jeans and a shirt that read NICE HIVES. He turned his head slightly, and oh, he was talking to another boy—a boy dressed all in white, his blue eyes fixed on her with a solemn, disapproving look. Ishida-kun? Why, Ishida-kun was dressed up in fancy clothes, with silver epaulettes and flashes of armor that suited a prince and perfectly matched his silver glasses. His white cape was tossed over his shoulders—the fabric looked as soft as whipped cream. He held a beautiful bow that was also silver and covered with lace engravings. She didn’t know what stung more—Kurosaki-kun’s rejection, or Ishida-kun’s look of disgust—even if Ishida was willing to marry her. The fact that she was a disgusting frog didn’t seem as awful as how the boys were reacting. Somehow, though, her undesirability and the boys being dressed the way they were made a peculiar kind of sense. Inoue Orihime had already figured out that she was in the land of night dreams where some things were plain and true and where other things were just plain crazy. The part about me being a disgusting frog must be the truth. I have always been a little slimy. I sweat more than most girls. Ishida held out his palm. For some reason, as she reached for it, the gesture felt disquietingly familiar, as if she had attempted to hold his hand before—no, that wasn’t right. There was no longing in her arm as she extended it. She wanted so much to be with the boy she liked, and the boy she liked had NEVER been Ishida-kun. Her arm wasn’t long enough—it was thin, pale green and was a frog’s arm—but as she held it out, it grew longer. Still, it would not reach her betrothed. Ishida gave her a stern look. She hopped forward with her large hind legs. How fun it must be to leap into the sky, she thought, and to swim far into adventures with an amphibian body, but still, she wished very strongly to have her legs back because she was sure that Ishida-kun would prefer them in a bride. Being certain of the power of her wishes, she looked down and instead of a disgusting frog body saw folds and folds of a very luxurious deep green formal gown. The boy holding her hand appeared unimpressed by her transformation. Fear. She was as familiar with the sensation as she was with any other—love, hunger, pain, joy. She felt fear in her throat and tears in her eyes. She wished she were still a frog and not a beautiful woman in a long flowing gown. She didn’t know. Why was her friend speaking in the voice of an enemy? Why was Death acting like a lover, and why was everything that was once so familiar now so strange? Hachi-san had told her riddles once about her powers. She had often wondered if she could wish things so. If she could wish things into being, she would’ve have cleared a meadow in her dreams where she and Kurosaki-kun would be standing now. It would be Kurosaki-kun holding that dazzling silver bow, and the sunlight would dapple the forest, and a white horse would be neighing softly while the prince promised a happy ending. What was the power of her wishing, then, if Ishida-kun was the one holding her trembling fingers while her heart lurched with doubt and fear? It was at this point that the night dream ended, and she who had been a frog princess woke up in a black room with no sense at all of who she really was. This dream, too, like the one that had preceded it, the one in which Death had told her she was never home, haunted her for many days. She who had been a frog princess walked straight home from school after this dream without whistling. She said hello to Ishida-kun here and there; she blushed whenever Kurosaki-kun spoke her name; she didn’t think much of her dream after a while but then there came a day when it was time to leave school and go to Hueco Mundo and prepare for another war and Ishida-kun could not go. And for a moment, only a moment, it flashed through her mind a vision of Ishida-kun as a prince in a cape like whipped cream, a prince who spoke in a stern voice and sounded like the Enemy, like Death, a prince who inspired fear …. Ha, ha, no, it was only a dream. I trust Ishida-kun completely. And with those thoughts, Inoue Orihime went to Hueco Mundo and beyond, to find herself and whatever place she could truly call home. It's so nice to see your writing again. I had forgotten about the beautiful fan art that inspired this piece; I thought the story was perfect before, but Orihime's footloose wanderings and strange dreams are a lovely reflection of the submerged dreaminess of this art. I know poetry written about art is called ekphrastic, I wonder if it's the same for prose? Whatever it's called, beautiful work, and I know Peca will be pleased. I don't write prose persay anyway--it's all some form of poetry. :) Esp short pieces like this one. Thanks for the beta. I just checked stats for bleachness and there were a gazillion hits on the 4th of July? I know the chapter convos are private but maybe people are really enjoying the Jugo/Bazz fight. I can always tell when the fandom is happy when I start to get reviews on very old fics. :D Maybe I'll find time soon to finish old Bleach fics on the backburner. I have a couple I started OH SO LONG AGO. I was on a vacation when this was uploaded (I hope you received the message I sent you through twitter). I'll repeat once again what I said on that message. I loved it very much and I was tickled pink by it. You are amazing Deb <333 . It is as ethereal, poetic and dream like as my drawing. It is short, but it packs a delicious mix of self discovery and rich tones of oneiric imagery. It makes me want to pet it :) .